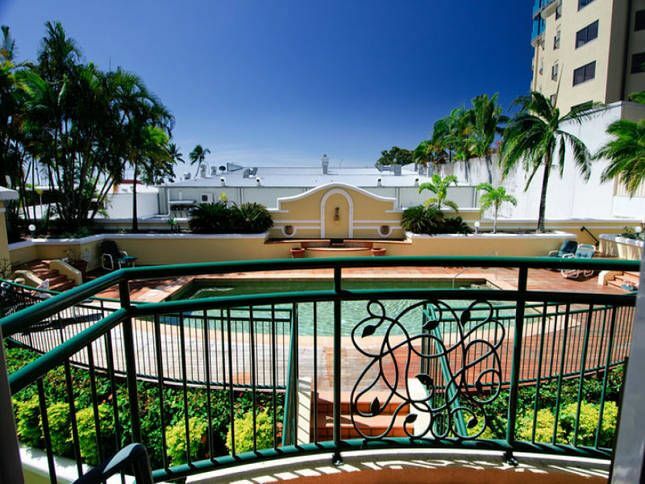 Il Palazzo está clasificado número 1 en Trip Advisor en Cairns! Un alojamiento precioso en una ubicación perfecta cerca de la Laguna / Esplanade y mercados nocturnos, cerca de restaurantes, supermercados y tiendas !! Es fácil caminar a todo. La unidad tiene un dormitorio con cama de matrimonio, sala de estar con sofá cama para 2 personas, cocina, lavandería, balcón con sombra, aparcamiento seguro cubierto, TV por cable. Wifi internet se suministra de cortesía por el mostrador de información turística si una reserva se hace de lo contrario está disponible en $ 5 por día o $ 25 por semana. El complejo cuenta con ascensor, una hermosa piscina (climatizada en invierno), zona de barbacoa, y jardín en la azotea con vistas al mar. Estamos ofreciendo nuestra unidad en descuentos significativos a los mejores precios normales que nos da feliz invitados y con suerte se mantendrá nuestra unidad totalmente reservado. Very convenient place to stay. We picked this apartment due to it’s proximity to the reef terminal and boats. It was close to all shops and services, the night market next door is good and wasn’t at all noisy. The apartment is well appointed with everything you need, and Peter is very helpful and answers questions very quickly. The combination microwave died on us one night, and he had another delivered the next day. We would stay there again. The staff were very friendly and helpful. Check-in was quick and easy. We arrived to find the air-conditioning already on which was great as it was a hot day. The room was clean and comfortable with plenty of room. The kitchenette had everything we needed. Nice big television in the lounge and bedroom. The location was great - right next to the night-markets, the esplanade just one block back, woolworths just down the road and plenty of other shops and food places within walking distance. Public transport close by so a car is not needed. Would stay here again. Very close to all amenities, we stayed for 2 nights, whistle stop tour of the Great Barrier Reef and the Skyrail tour. All amazing. Peter ant the reception staff really helpful and responsive to my email enquires. Surprized what a great accomodation..Great space ,self contained kitchenette ,heaps of room . Awesome location, in the middle of everything. Felt safe and had a lot of fun! Awesome time in an awesome place. Check in and out were easy, and it was located in the middle of everything. I’d definitely stay again. Such a great place to stay whilst you are in Cairns. Close to everything and no need to hire a car. Unit is very clean and has everything in there for a perfect stay. Communication with the owner was great and the people on the front desk were very helpful booking tours. Highly recommended and will use again when we are up there next time.